I had been avoiding beef preferring chicken and fish but lately I had a yearning for broth and chicken was scarce -- if you could find it at all. I went on the hunt for beef bones to make a delicious broth. I bought two pounds of beef ribs, mostly bone with some meat, perfect for making bone broth. Broth takes a long time of slow cooking, up to 24 hours. I prefer to start early in the morning and let it cook for eight hours or so. After letting it cool for two or three hours it's time to put the broth in the refrigerator overnight to remove the fat the next day. The main ingredient is, of course, the two pounds of beef bones. To increase the broth's flavor I add a lot of vegetables. Being a frugal kitchen whenever I buy vegetables I freeze the trimmings to use them when making soup or broth. The vegetable freeze bag usually contains carrots, brocoli, bell pepper, cabbage, parsley and cilantro stalks, celery and other greens. In addition to the above I add an onion, two sweet peppers, bay leaves, some leek, black pepper corns, and two or three crushed cloves of garlic. It does not matter too much what vegetables you add but avoid starches which make the broth cloudy. Use greens. Water to cover and half a teaspoon of salt. Thaw out the vegetables in the large stock pot that will be used to make the broth. Wash the beef bones, trim and discard any excess fat. Arrange the pieces in a single layer on a drip roasting pan. Not liking the taste of beef fat, I discard the drippings. Some cooks might give them some use. Preheat the oven to 350 or 400 degrees. Roast the beef for an hour turning the pieces once. Add the beef to the stock pot and cover with water. Add the remaining vegetables, the spices and the salt. Turn to high heat until it starts to boil. Then turn down the heat to simmer. Never let the broth boil vigorously as that will make it cloudy. Skim off any scum that forms. Cover the stock pot. Check it a couple of times at fifteen minte intervals to see if any more scum shows up. Check also that there is enough water to cover. Add more as needed. After eight hours or so taste the broth to see if it needs more cooking. Once done, remove and discard the vegetables. Remove the meat from the bones and shred. Save the meat, discard the bones. Strain the broth using a fine cheesecloth filter. Let cool to room temperature and put in the refrigerator overnight. Next morning remove the fat. I discard the fat but some cooks might want to use it. I like the broth to be perfectly clear so I clarify it with egg whites. This step is not necessary if you don't mind a bit of cloudiness, it won't affect the flavor or anything else. Wash two eggs making sure they are perfectly clean. Separate the whites, discard (or save) the yolks. Crumble the egg shells and drop them in the broth. Add a bit of water to the egg whites and beat lightly. Stir into the broth. Boil the broth at medium heat until the egg whites congeal and separate so you can see the clear broth. Strain through a cheesecloth. 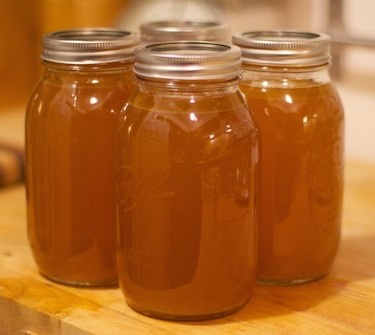 The clear broth will keep for at least a week in the refrigerator. It's excellent as a hot drink and as the base of a good soup. The shredded meat fried with onions, garlic and sweet or bell peppers makes a tasty dish. Last updated December 27, 2015.